Yesterday my dear friend Steve (Ali’s too!) spent the whole day building a ramp for Ali so he can get up the 6 steps to the porch at my new place in Petaluma. 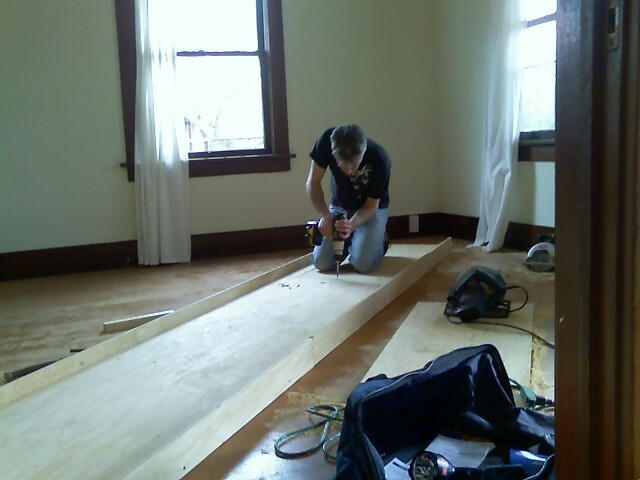 I am tremendously grateful for him for building this for us – it was a big job and took hours! But now it’s all set up and all that remains (besides painting it) to be seen is whether Ali will be able to get up and down it okay in his new wheels (which won’t arrive for another [long!] two weeks). It should be fine, but of course I am nervous it will be too steep. Anyway, it is a tremendous relief to have the ramp built. Thank you, Steve!!! The materials cost about $200, but at least I didn’t have to pay someone to build it (and thank you again, Steve, for also donating the paint!). I spoke to my good friend and SF roommate, Courtney, tonight. They have started reluctantly interviewing people for my room and are sad about it – as am I! I looked up the listing for my room on Craigslist and it bummed me out; I remember us all writing the description together when we were looking for another roommate six months ago. This time it’s me being replaced – although nobody wants it! It will be hard when I go back to pack up my things once and for all. I have not been back there in over a month – ever since I left that morning to pick up Alec from the vet hospital. Right now it feels like I am just temporarily “away.” I don’t want to go back and say good-bye forever! Still, I can’t overemphasize how happy I am that Alec is here with me and doing so well all things considered. I am grateful I have this chance to take care of him and that is my one and only focus. While all this is true, saying good-bye to my old life will be sad too.